A collective sigh of relief is rolling through the central Sierra Nevada as Yosemite National Park officials prepare to reopen Yosemite Valley, which has been closed for nearly three weeks due to the Ferguson Fire. "Everybody is very excited to be able to go back to a sense of normalcy," said park spokeswoman Jamie Richards. "To be able to go from saying this is indefinite to being able to say, 'Look, we're going to plan to reopen the valley,' feels very good." Yosemite Valley — by far the most popular part of the park, known for its views of cascading waterfalls and monumental granite formations — was closed to visitors on July 25 due to unhealthy air quality caused by smoke from the blaze. The following week, the fire entered park boundaries, and officials announced that the valley and other parts of the park would remain closed indefinitely. Now, firefighters are making significant progress on the blaze. As of Sunday afternoon, the fire had burned 95,947 acres and was 83 percent contained. Richards says park officials have assessed conditions and feel it's safe to reopen the valley to visitors. They are asking people to drive with extreme caution because there is still active fire and smoke in the area. Officials also say there will be limited visitor services as the park resumes normal operations. 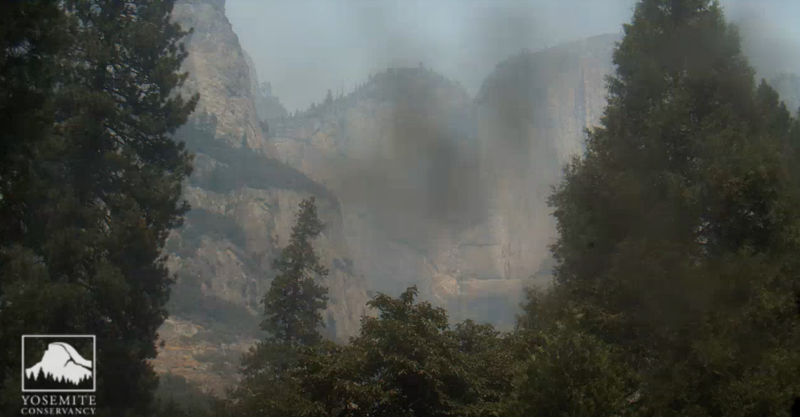 Wawona Road from Yosemite Valley to the Wawona area will remain closed for at least another week. Richards couldn't estimate the number of visitors the park is expecting to see when the valley reopens on Tuesday, but she said people are excited. "We know that there's going to be a lot of excitement in the air," she said. "We know that we're going to see people coming back, and it's going to be a really great day." Ferguson Fire public information officer Tom Efird says firefighters are relieved they've been able to prevent the blaze from hitting Yosemite Valley. "Good fire management and hard work by the firefighters have been able to keep the fire out of Yosemite Valley proper," he said. While crews have been able to bring containment up significantly on the fire, Efird says the fight isn't over. "There's still a lot of hard work to be done," he said. The fight is also far from over for the communities surrounding Yosemite, which rely heavily on incoming campers, hikers and climbers for business. The valley's closure is the second longest in park history, and it came at the peak of tourist season. "In all these communities, we rely heavily on visitors, on tourism to stay viable," said Steve Montalto, creative director for the Visit Yosemite | Madera County visitor's bureau. "It's really put a significant impact on the amount of people coming to the area." On a normal summer day, Montalto says, the Madera County gateway would be "hustling and bustling," with tourists stopping at grocery stores for supplies, eating in restaurants, and visiting the local brewery and wine bars. "That has all been much, much, much quieter," he said. Montalto says the rough estimate of financial losses for the entire region — including Yosemite National Park and its gateway communities — sits at about $50 million. And while there is still some summer left this year, the reopening isn't likely to alleviate the losses suffered over the past few weeks. "We're definitely hoping for a pickup," he said. "It's a bit of a challenge because within the next couple of weeks, schools are starting back up. So the flexibility of families getting out to travel is small." Yosemite National Park and its four gateway communities are launching a campaign called #YosemiteNOW in an effort to bring tourism back to the region following the closure. The Ferguson Fire ignited on July 13 in the Sierra National Forest, and it has burned into both the Stanislaus National Forest and Yosemite National Park. The wildfire is the largest ever to hit the Sierra. Two firefighters have died battling the the blaze and 15 others have suffered injuries. Cal Fire Heavy Equipment Operator Braden Varney, 36, died on July 14 after his bulldozer overturned in a steep ravine. Brian Hughes, 33, captain of an elite firefighting squad stationed within Sequoia and Kings Canyon National Parks, was killed on July 29, when he was struck by a falling tree. Fire officials hope to have the blaze fully contained later this week.